New hiking book is now available! I finished my book about my 7 year hiking adventure on the Idaho Centennial Trail. 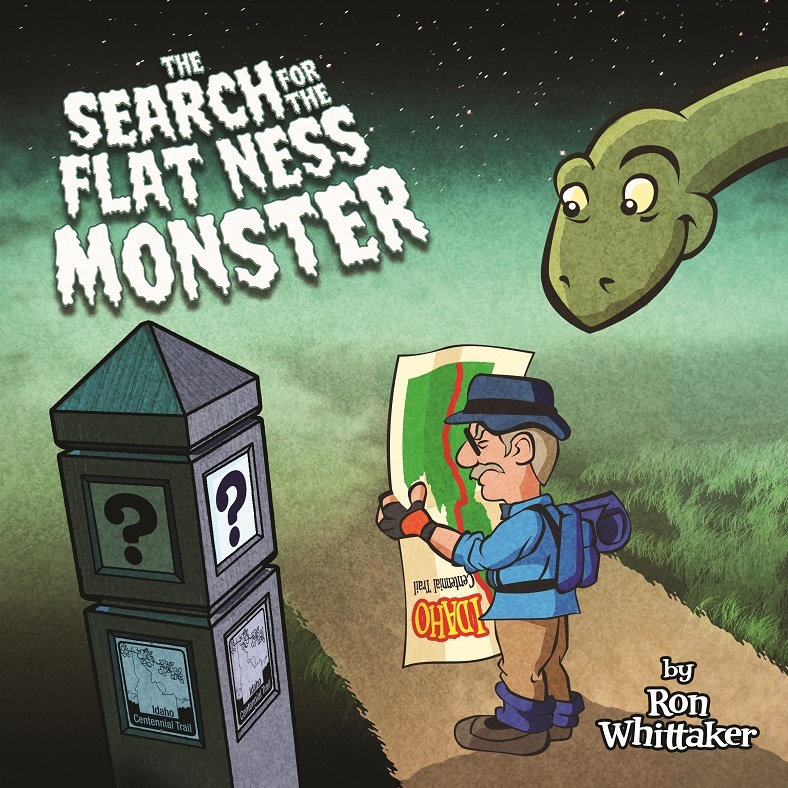 It is titled "The Search for the Flat Ness Monster." It is available in paper and as an e-book. It is available at Amazon.com, Barnes and Noble, and Authorhouse.com. I haven't updated this in a long time. I've been busy walking. I finished 2015 with 1,006 miles of walking. 4th consecutive year to break 1,000, and I set a new record by 1 mile. I need to go back and back fill my blog for 2015. There were many interesting new places I hiked that I want to share. Here is my updated hiking map for hiking across Idaho. A lot of what I worked on in 2015 was the southern leg of my proposed "Great Eastern Loop." 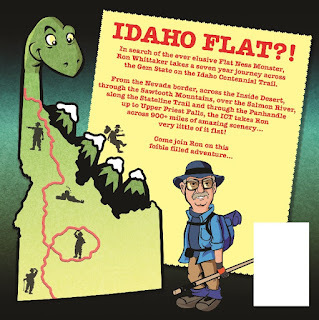 I started at the southern end of the Idaho Centennial Trail back in February and extended east as far as Interstate 84. During July I hiked from the eastern shore of Bear Lake in southeast Idaho as far west as the town of Weston. There are about 76 miles remaining to close the gap of the southern section. 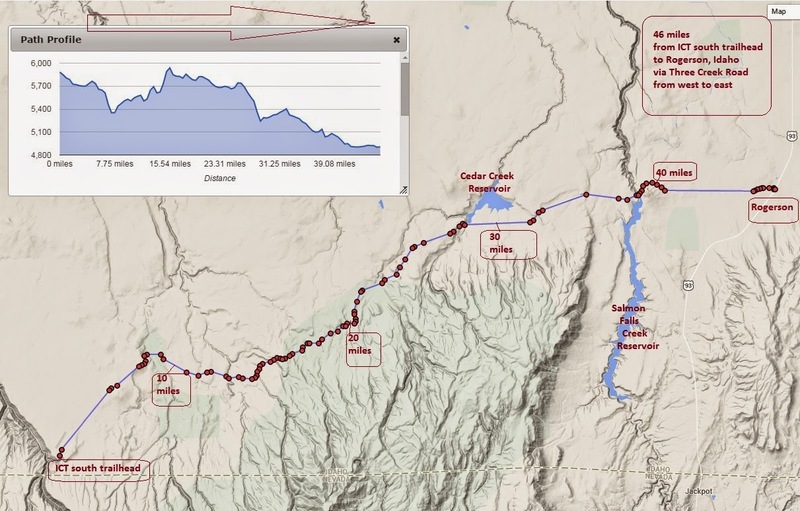 the last 2 weekends ( March 15-16 and March 22-24) I have put in 53 miles of hiking in southern Idaho. the town of Rogerson, Idaho has been my base for food and supplies. The first installment was 6 miles (x2) to the east of Rogerson, on Shoshone Basin Road. next section was 47 miles from the beginning of the Idaho Centennial Trail south terminus heading east on Three Creek Road. it was pavement all the way. The attached map shows my route. Darwin Clampitt helped with shuttle duties. I parked my car in Rogerson, and Darwin dropped me off at the western end of the hike. Sunday afternoon I hiked 16 miles, the first 10 of which were without my pack and gallon water jug. I camped beside the road Sunday night. It was very windy and rained some near dawn. Monday was a 24 mile day. The wind blew hard all day. Thankfully, it was at my back for the entire route. Waves of snow showers came through about every hour, each one progressively stronger. After 6 hours of walking, I stopped for a break. I put my tarp against a barbed wire corner post to hunker down against the wind. As soon as I stopped moving I began to get cold. However, I needed the rest and the lunch break. After an hour rest, I moved on. I walked another 4 hours to get to Salmon Falls Creek Reservoir and the Lud Drexler campground. Once again, as soon as I stopped moving, I stopped generating warmth. It was getting cold and I was concerned about staying warm. For the first time ever in my hiking career, I camped for the night in a bathroom. It was a pit toilet, but it was one of the handicapped sized versions. The floor was clean. I was a bit on the desperate side. I knew I was in the beginning stages of hypothermia. It was a matter of survival. Getting inside immediately got me out of the wind. Wearing just about every article of clothing, with my new down booties and my snow cap, and my hood, and Underarmor gloves, with the sleeping quilt made by my wife and my Thermarest mattress beneath me, I was able to get warmed up and stay warm (mostly) all night. It was a much needed rest after a 24 mile day. In the middle of the night, I though there were bears in the garbage dumpsters, because they kept banging around. When I got up and looked out in the morning, I saw that it had been raining and it was still very windy. The wind must have been rattling the dumpsters. I walked the remaining 7 miles into Rogerson, still with a strong wind at my back. I learned some very interesting history about the area and the Jarbidge Canyon area from a very knowledgeable lady at the cafe'. The cheeseburger was to die for, by the way! a *miscellaneous* video of some road walking sections of the Idaho Centennial Trail along the Idaho-Montana Stateline Trail. I had vehicle support for these sections. The first part is between FR 506 "Route of the Hiawatha" bike path along FR 391 to FR 305 near Dominion Peak. The second part is a road walk between the Stevens Lakes and Lost Lake trailhead down across Interstate 90 to Larson Road. Chronologically, these hikes took place the day before the hike shown in Part 05 "The St. Regis Gambit." Tyler Parrish and Cody Wolter were my chase team. "The best laid plans of mice and men....." What happens when one of the shuttle vehicles goes out of commision? 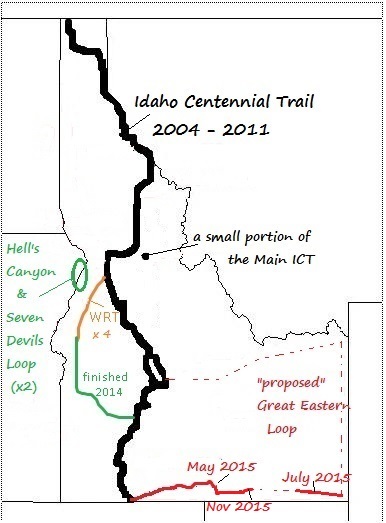 This was a planned 40 mile hike on the Idaho Centennial Trail in August of 2008. My 93 Aerostar minivan died at the takeout trailhead, which was Five Mile Pond on the Crooked River Road. Our plans for a one way hike together were busted. Using Jerry's vehicle I drove him around to the other end at Rocky Bluff Campground, on Slate Creek. He would now hike solo across the 40 mile stretch, going roughly Counter Clockwise around the western and northern edges of the Gospel Hump Wilderness. While my van was being towed and repaired, I would camp at Five Mile Pond on the other end, and wait for Jerry. I had 3 days of time to kill. Inspiration came to "improvise" a new hike while I waited for him. I needed to make a connection between Five Mile Pond on one end, and French Gulch on the other end. 19 miles going, 18 miles coming back. Since Jerry had problems with the ICT section in between on his previous hike, I planned a long road walk around, using an existing network of Forest Service and discontinued roads. 6,396 foot Mt. Heinen is in the background. 1st pic is Tyler my son-in-law. 2nd pic is me.